The art show and auction showcases talented Pensacola State students and faculty, revealing the power of recycled products in the creation of beautiful and practical two-dimensional and three-dimensional pieces. 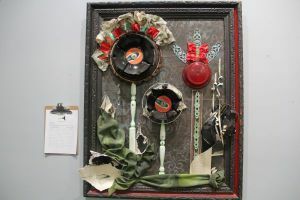 “Artistically Repurposed” runs through Thursday, May 25, in the Anna Lamar Switzer Center for Visual Arts on the Pensacola campus. The exhibition is open 8 a.m. to 5 p.m., daily and will end with a reception and auction set for 5 to 8 p.m., Thursday in the Switzer Center. Faculty jurors will select artwork for awards, including first- through third-place and Best of Show, and cash prizes. Faculty pieces will be included in the auction, but not the juried show. “The art show came out of a primary desire to highlight the importance of recycling and reusing materials and how buying recycled items through the Pensacola ReStore can help both the planet and address housing issues in the local community,” said Connie Bryars, director of Retail Services at Pensacola ReStore. With the sponsorship of Pen Air Federal Credit Union and Pensacola State, the hope is to create a unique, signature event that the students look forward to every year, she added. For more information on “Artistically Repurposed,” contact Bryars at 850-476-0001 at cbryars@pensacolahabitat.org.